I’m almost shying away from pressure cooker pork recipes, but then I thought I’d toss this one in there as something new and throw you for a loop. Because it’s not quite a pork dish, but then it has sausage in it, which is still pork. But, you get the jest- I’m trying to give you something new here. Last year, around this time I started the Keto Diet. I’m not much on weighing myself, so I really can’t tell you how much I lost. But I can tell you that it was noticeable, and I felt good too. Actually, when I found out I was pregnant, my grandmaw said “Oh and she just lost all that weight, too.” Nice, maw maw. Nice. I’ve crafted up a lot of my own Keto Recipes, just basing meals around meat and vegetables. But there’s just something special when you find alternatives to some of your favorite meals- that aren’t so healthy. Like Loaded Cauliflower Mash instead of Loaded Mashed Potatoes. I can’t wait to share that recipe with y’all. My sister was the first to introduce me to Zuppa Toscana, and I was a little apprehensive with the kale. It was my first time trying kale, but this soup was the bomb diggity. 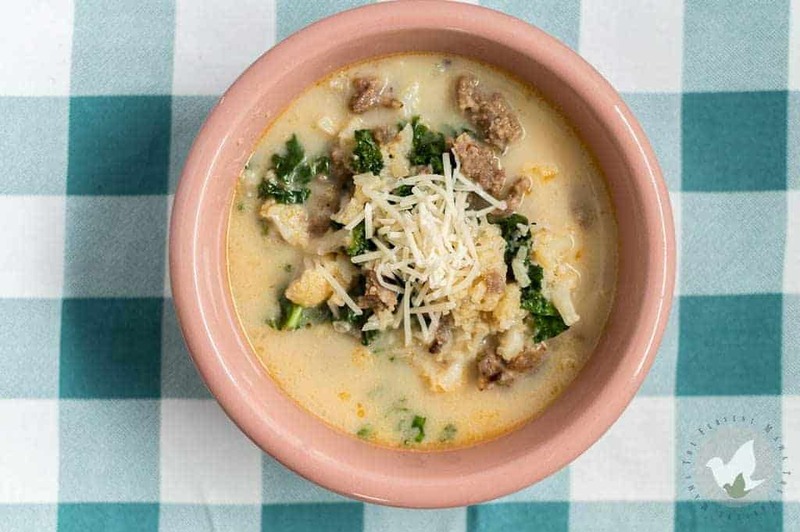 So this Low Carb- Keto- Whole 30- Paleo- friendly Zuppa Toscana alternative may be even tastier than it’s original Olive Garden couterpart. 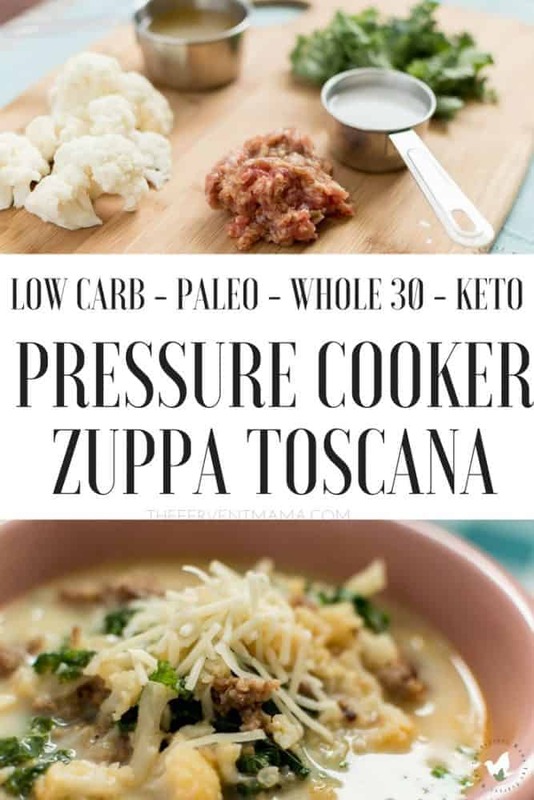 With cauliflower instead of potatoes and unsweet coconut milk in place of heavy cream, this Low Carb pressure cooker Zuppa Toscana is awesome! What makes everything even better is the fact that it’s all done in the pressure cooker; one dish, minimal cooking time, extra yum. 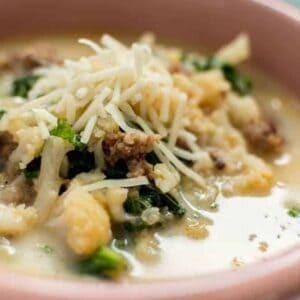 If you’re familiar with Zuppa Toscana, then you’re basically following the same instructions in just a different order. You don’t even have to worry about eating too much of it, because you will want to eat it all. 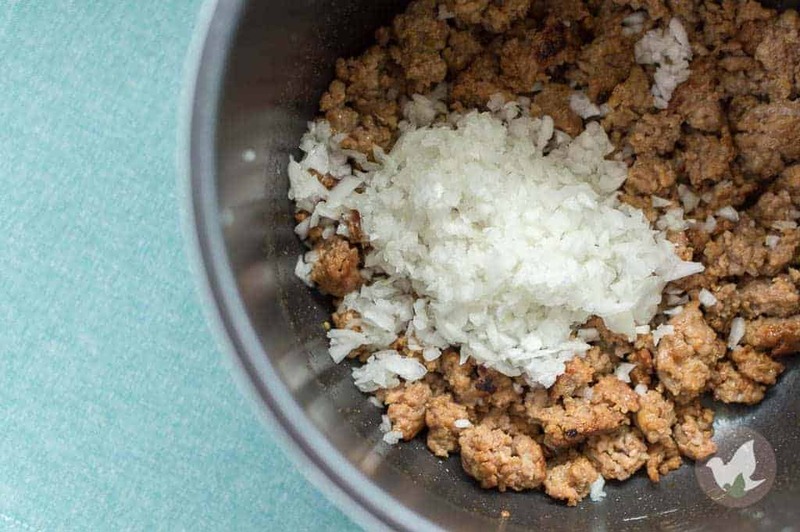 Grab your favorite Italian sausage and put it in your pressure cooker. You’ll want to brown it completely on the sear setting. Once it’s cooked through, you’ll want to remove and drain the fat. While the fat is draining, put in your chopped onion cook until soft. Add the ground sausage back to the pot. Add chicken broth, cauliflower, and all seasoning. Close and lock lid, put on High pressure for 3 minutes. When it’s finished cooking, perform a manual release and immediately add coconut milk and kale. I like to put my pot back onto the sear setting and stir gently until kale wilts. BOOM. You’re completely done. 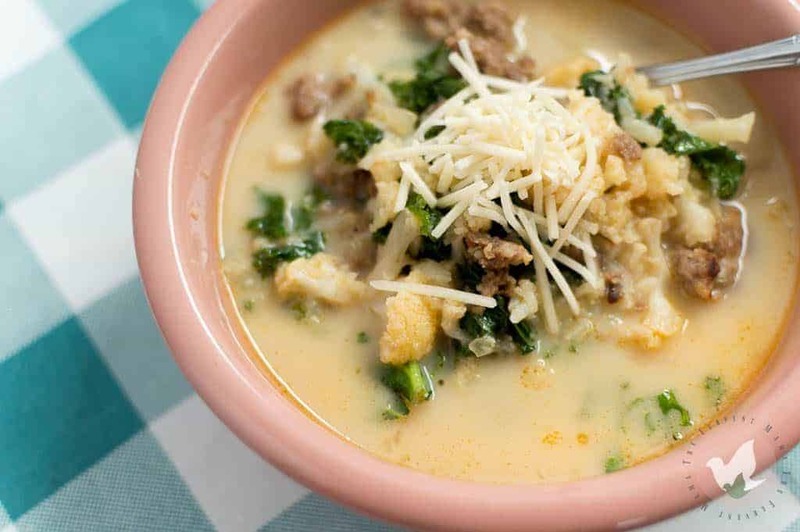 This Low Carb- Keto- Whole 30-Paleo Zuppa Toscana Soup is finished in less than 30 minutes, but it tastes like it’s been slow cooking all day long. The flavor in this soup is out of this world! I love topping my soup with a little shredded parmesan cheese. It just gives this soup an extra depth of flavor. I can literally eat this soup every week, and sometimes I do. Because soup is good for the soul, right? Turn your pressure cooker to SEAR and brown your sausage. Add in chopped onion and cook until soft. Add in minced garlic and cook for another 3-4 minutes. 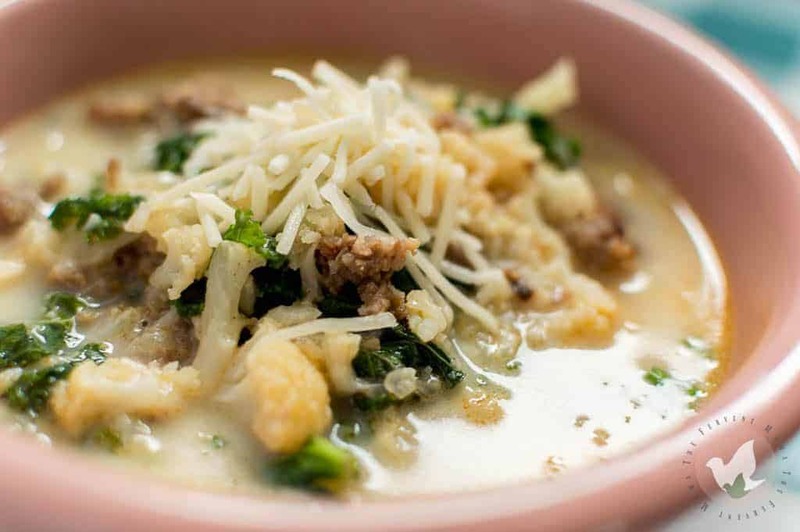 Add sausage back in with chicken broth, chopped cauliflower, and all seasonings. Close lid and cook on high for 3 minutes. Add in coconut milk and kale. Stir gently until kale wilts, try not to break up cauliflower. You may need to use your sear function again. Once kale has wilted, you can serve topped with parmesan. Do you have a recipe that you’d like to have transformed to a pressure cooker version? Link your favorite recipe, or write it out in the comments and we’ll do our best to make the best version of it just for you! This is a great recipe! 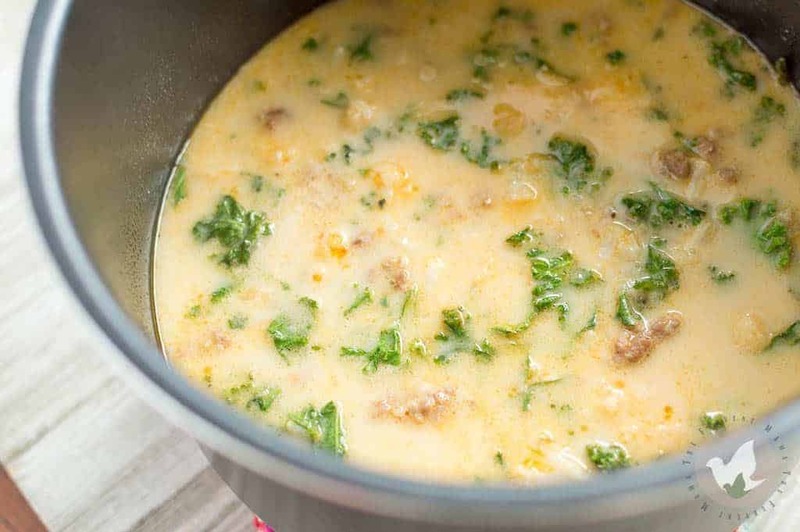 I’m a true italian and I love the real Zuppa Toscana. This is a great replacement when following a low carb diet. Thanks so much for your kind words, Jessica! We’re glad you enjoyed it! Ashley, I have had people say that it was a little spicy, but none that said it was too spicy to eat. Maybe try adjusting the spice-based upon your taste buds next time! Any idea on how to do it in a crockpot? Looks delicious! Can you use frozen cauliflower? I also am thinking of using an Emerson blender on a few of the florets to make the soup a little thicker but I saw you said to be careful not to break the cauliflower. Does that effect the taste in some way? Hi Kim! 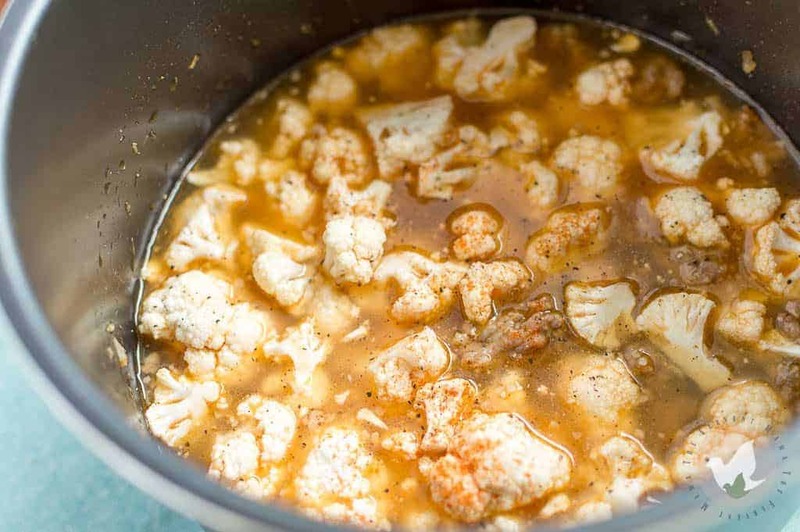 You can definitely use frozen cauliflower! The soup would be thicker, but unless you separate the cauliflower from the other ingredients using an emersion blender would also “blend” those. It doesn’t affect the flavor, per say, but if you want the cauliflower to take the place of the potato, you don’t want it all broken. You’d want whole pieces. But it’s definitely a personal preference. Any thoughts on substituting ground sirloin for italian sausage? I think it would be fine. However, it wouldn’t have the herby “Italian” flare that the Italian sausage gives. Although you could always add a little Italian seasoning (maybe 1/2 teaspoon) if you feel like it needs it. Made this today, it is soooooo delicious!! Thank you for this yummy easy recipe!! I made this tonight and my husband and I both enjoyed it very much. I changed just a few tiny things: the recipe says 1 tbsp salt, which in my opinion would be enough to ruin the whole pot! I used about 1 tsp. Also, I used only about 1/2 tsp of pepper and 1/4 tsp of cayenne (any more than that would be quite hot for me). Along with the coconut milk I added some half and half I had leftover in the refrigerator. Tasty! I feel like the kale would still be really kind of tough with this small amount of cooking (“till wilted”). Does this really work out well? I am considering using spinach or Swiss Chard instead. Personally, I think the kale turns out perfect after it wilts a little. It takes about 10 minutes on the SEAR function. 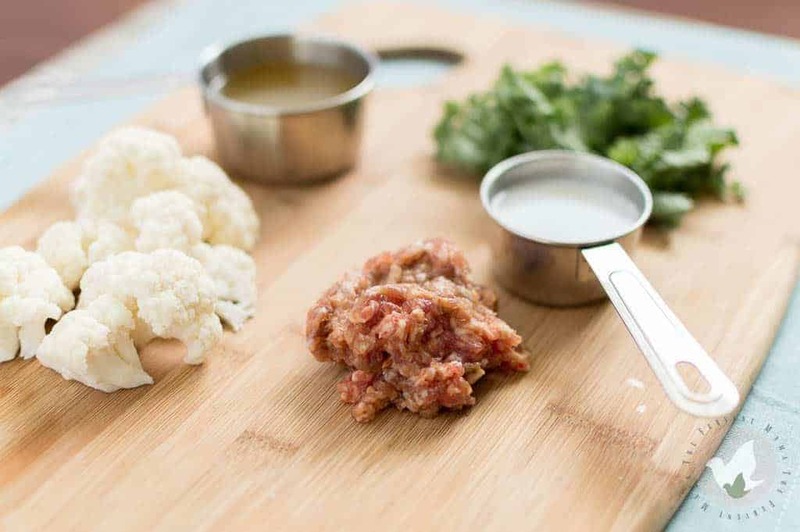 However, if you’re worried about the cook, you could always add it in with the cauliflower throughout the whole cook time to be sure that it’s really tender! Although, fresh spinach would be a great alternative! Is manual the same as quick pressure release? Hi, looks delicious. May I ask why you’re using the coconut milk instead of heavy cream? Cream is one of my favorite keto ingredients and it seems to have no carbs no matter the brand. Thanks for the clarification! I feel bad for those other non-dairy weirdos!